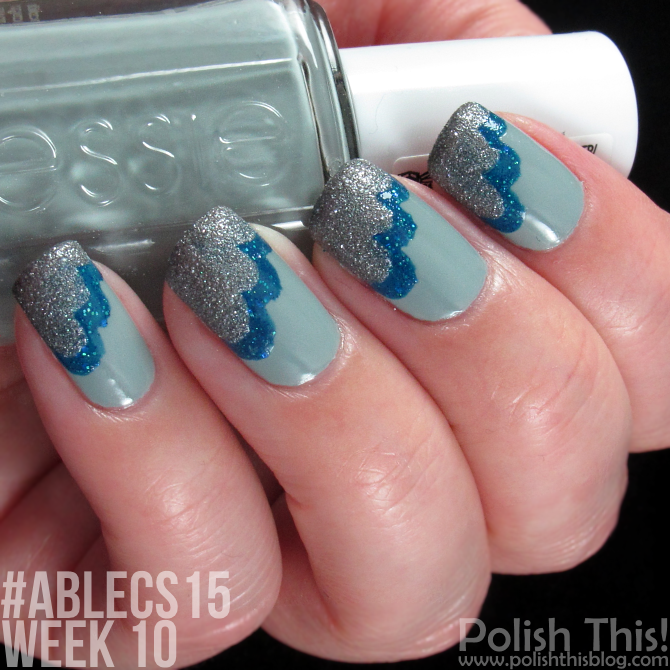 #ablecs15 Week 10: Rainy Day - Polish This! I have my second #ablecs15 week 10 manicure to share with you today! The theme for this one is Rainy Day and at first I had this idea that I'd do something bright and fun for the theme since that's probably something I'd do if I was painting my nails on a rainy day. But then I thought that I have never tried the cloud design by Nailside and I have always wanted to try it, so this was really the perfect theme for the look. I'm pretty sure you all have tried this already since this style was everywhere at some point, so I'm a bit late with this one, but better later than never. As the theme was Rainy Day, I wanted to use some blues and greys for this look to make the mani suit to the theme. Of course this would look cool with some bright colors also or pretty much anything. I also wanted to use polishes with different finishes, so I chose one creme, one shimmer and one textured polish. I used my go-to grey creme, Essie Maximillian Strasse Her as my base color. I used two coats of it and then I did the first 'cloud' with Powder Perfect Hidden Well. Then I applied a coat of top coat and waited it to dry a bit. Finally I did the second 'cloud' with Kiko Sugar Mat Light Taupe (455). The design was fairly easy to do, thought I didn't get my clouds as round looking as I wanted. I should have probably chosen some polishes that have a bit smaller brush or at least a flat brush. Both Powder Perfect and Kiko have quite thick brush, so they weren't really the perfect choice for this look, but at least I still managed to just about do the design. I surely will be doing this look again. It's fun, easy and good looking, I can't really believe I waited this long to try it! I love the cloud design. It looks so pretty and is so easy to do. I love the colors you used and that gorgeous silver texture. So pretty.